We are back! More on beautiful stained glass windows from around the world! 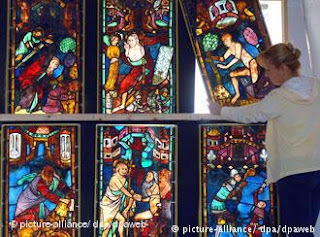 Russia has returned six medieval stained glass window panes looted by the Soviet Red Army in 1945 to a church in Frankfurt an der Oder, on the Polish border. The 700-year-old windows were thought vanished or destroyed until 2005, when they were discovered by a Russian art historian at a cloister outside Moscow, under the jurisdiction of the Pushkin Museum. The first 111 panels, which had been in the possession of the Hermitage Museum in St. Petersburg, were returned by Russia in 2002. Another three years would pass before the remaining six panels dating back to the 14th century would be restored to their rightful home at the Marienkirche, the Church of Our Lady. Completing the panel of 117 panes in the church's 20-meter (65-foot) high windows depicting scenes from the Old Testament, the panes were delivered by German Culture Minister Bernd Neumann and Russian Ambassador to Germany Vladimir Kotenev. In 1958, some 1,5 million works of art were returned to East Germany by the Soviet Union after the Hague Convention for the Protection of Cultural Property made it illegal to use cultural property as war reparations. Previously, Moscow declared that art seized by the Red Army was retribution for the 27 million Soviet lives lost during the Second World War. That't all for now!! 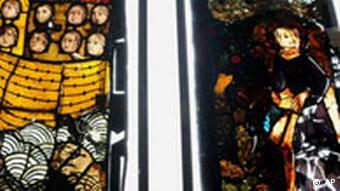 History & Stained Glass Windows...learning all the time! May sunshine fill your day!